Creepy night to watch out! It seems that councils and governmental institutions never seem to have enough papers of you LOL. Got a phonecall on Wednesday late in the afternoon (at about 17.30 which is late for them!! ), just was busy cooking, so not a good time. Well, the lady said she still missed a bankpaper(I was surprised, because I checked 3 times before sending all), and she asked me if I could email it. Okay, email no problem, but I never used my scan option on the printer yet, so I first said I couldn;t do that and that I would send a copy by post the next day. But here it comes: she answered that it was okay, but that the whole routine would stagnate for about 10 DAYS, because they were a bit behind in work and that a copy would have been scanned first at their office in the postroom, then all post should be sorted out for the various departments etc etc. I wonder how the people in the postroom there work then, unbelievable it should take that long. I could though bring it next day myself at the office, but it is not near from our house, it takes a tram and bus to get there and would take about 30-45 minutes! Not my idea of fun time spending. Anyway, after we had a bite for dinner I tried to do the scan, and whoppee, it worked. Now only had to make a pdf file for it. Took me some searching(I never made a pdf file before for sending with email), but finally I managed that too. So next morning I called the lady, telling her I sent her an email. After about 10 minutes she called back that all was recieved well. Let's hope we soon get a letter of how the social security will pay us some survival money! Now hopefully today it will be a more relaxed day. Weather should be fine, even with temperatures of about 66 to even 68 F. Tomorrow about the same, no rain, some sunshine, so perhaps good time to do a bit in the garden. Jan already cut down some of the big dahlia's, and they have to be taken out and dried and stashed away till next spring. Our Brodski suddenly found a new place to sleep, he changes that every now and then. Now he likes very much the chair in front of my computer. That's okay with me, but he gets very grumpy, when he has to move from there, because I must do something at the computer. and have to be careful not to stand up to get something and sit down without looking at my seat. Cause as soon as I lift my butts, he already jumped on the chair! So today is Halloween. I know it is celebrated all over in the US, here in Holland they do something about it, but not as extended as overseas. 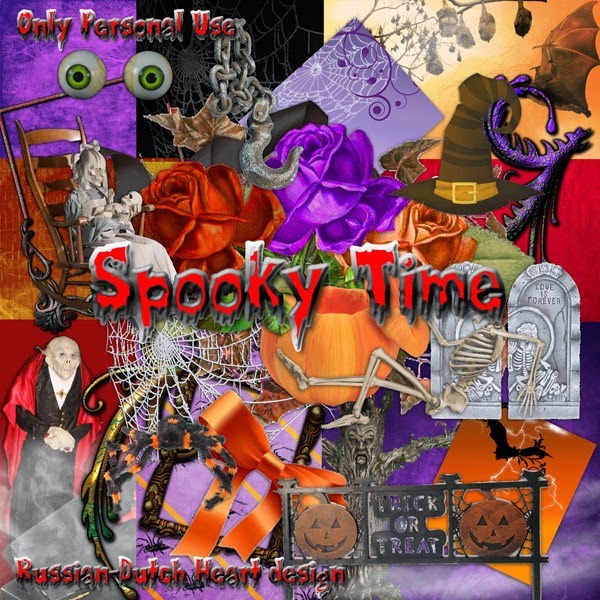 To stay a bit in the atmosphere, I've made you a little Halloween kit, named Spooky Time. Uploaded it in two parts, so Monday you will get the other part. Have a wonderful, not too creepy Halloween, eekh!! Oh, I am posting a bit late today, but I woke up later than normal, but it was after a very nice sleep. Sometimes you wake up and you know you had a good sleep, but still are feeling tired, or it takes long for you to really wake up. But this night I had a real sound and wonderful sleep, at the least it felt this way waking up. So I don;t mind I am a bit later, I feel almost great LOL. Monday afternoon I did go to town center, I wanted to look for a new coat, the one I have for winter is ready to retire, so I went with hope to find one. Not always so easy for me, because I have to look at the children's department, yeah! Often lady sizes are just a bit too big. Oh my, I felt like in wonderland when i entered the first store. Rioght away I noticed a sign, that on many coats/jacks they had a discaount of 50%! Well, you know me, never letting go a bargain if I can, and yes, right away I saw a nice jack, that fitted well, and was to my liking. I have a picture of it, well, it looks almost like it, I only don;t have so many stitched parts on it and I have it in a kind of darker cappuccino color. The jack is really thick and warm, so I will be well protected at times that the temperatures are low. And if it will freeze really hard I still have one that reached to over my knees. And do you know what I payed for it? Only € 15,00! Now you can call that a bargain. After that I went looking for one or two more Christmas presents andoh, what a good day, I found them. So my trip to town centre payed off. This month I also received a payment of a pre-pension thing I joined for several years when still at work. Oh, it's nothing substantial, very, very modest amount each month, just a few tenners, but money is money. And i had also back payment from Januari till September and it comes at a real good time, now that we are a bit uncertain of the money we will have next month. also not substantial,(mostly because there are dedected lots of taxes) but every penny counts, LOL. It did me feel real substantial older when I received it, yeah, I realized I am heading towards pensionary age real quick. Yesterday was just a normal day, did some grocerie shopping, turned on the washing machine again, even did a little bit of designing for a kit, and today I think there is no need to go out , so I may do some ironing, before the pile gets too high. And while the washing machine is empty now, I better also change bedsheets. Today I have some lovely clusters for you from Arlene, made with the Love the Memories kit. 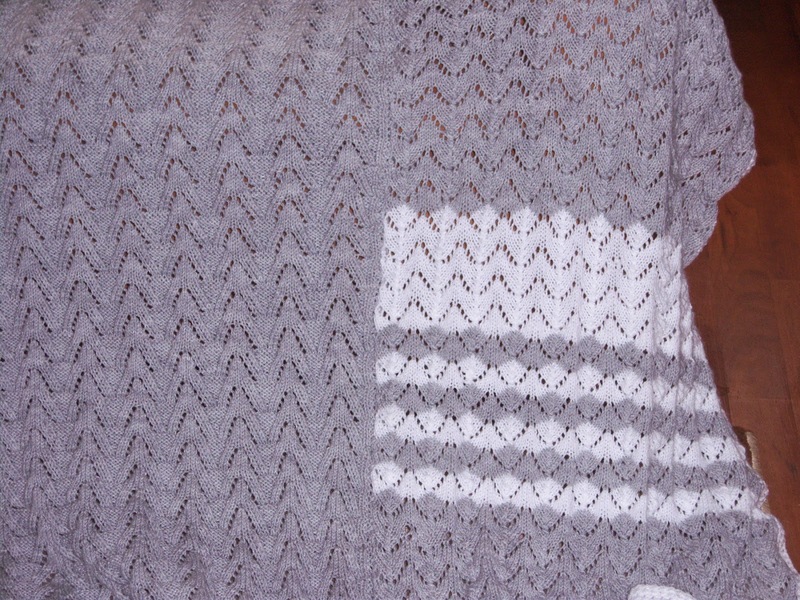 And I may have already another kit for you on Friday. Whoooo, I am slowly getting back again. Installed program for my photocamera. I start with the news that there isn't all too much news to tell LOL! I shouldn't make up plans, they seldom work out, you know. I said that may be we could do some gardening on Saturday. But by the time I was ready on the computer and had a quick walk to buy the newspaper, the weather became cloudy, and the sun disappeared. So it wasn;t too agreable to be in the garden. Oh well, there will come another day for it. Yesterday I took a computer day, yeah! I first finished a kit I was working on, also started on a new one, contribution for the new World wide Christmas scrapbooking blogtrain and I also installed the cd with program for my digital camera, finally! 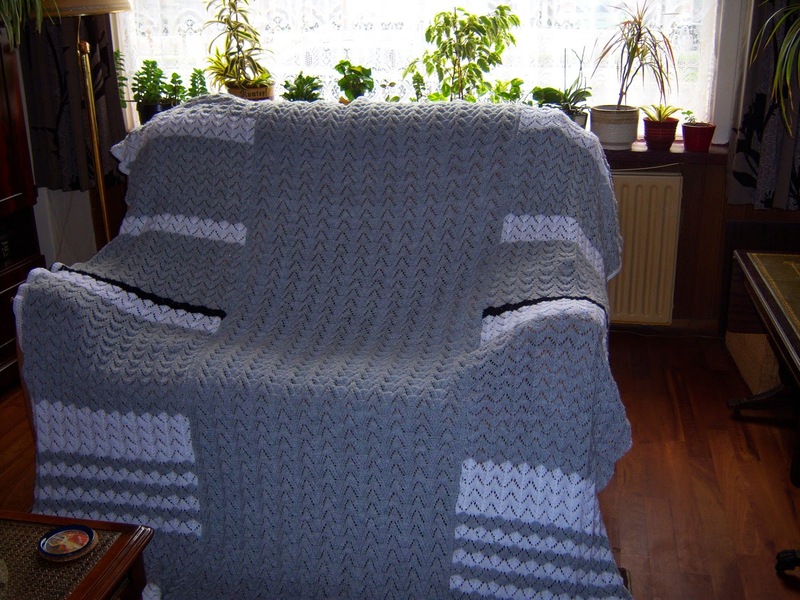 That went rather smoothly, and I remembered I made some weeks ago a picture of the blanket i knitted for Heidi. So this morning I wanted to upload it to the computer, and you almost can guess what happened. Something was missing in the device driver. Bummers!! After a bit of searching I tried the update of the program and oh my, a miracle happened! My camera was recognized by the computer and I could upload the picture. I made two, one of about the whole blanket and one close up, so you can see better the stitch I used. It was a long work but I was very happy with it. This one fits a bed of about 140 cm wide to 200 cms. long. As I have to stay busy when watching tv, I started with another one, in a kind of peach color, and I want to mix that with some dark brown, I think. We already have one blanket on our bed that i knitted, but it never hurts to have another one, is it? Time now to make a pot of coffee and soon wake up Jan, because health care will come this morning. Jan wants to suggest, they quite coming for now, because his legs looks okay, but has to ask, if the contract still holds on for the 3 months it was signed. If may be after a couple of weeks his leg might swell again, it would be nice if we could just phone them and they come over again. But I want to be sure that it will be still on a free basis( as it was ordered by the hospital, we don;t have to pay anything for it). 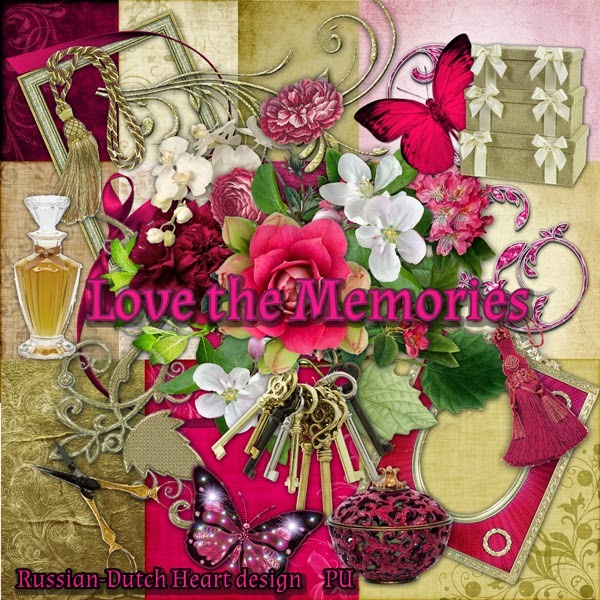 Today I have the 2nd part of Love the Memories kit for you. At the moment the weather looks not bad, I see some sunshine and almost no wind, if it stays this way, perhaps I will go out this afternoon, could be to town center, where I can look for the last Christmas presents, that have to be send in a box. Like to have all ready way in time. Wishing you all a perfect day! I was really busy yesterday. I just had no more energy yesterday afternoon to write a proper post, so here I am on an unusual Saturday morning. What did I do on Thursday? Oh yes, the weather had cleared up and I went first for some grocerie shopping. It was even rather nice outside. Then after being back, some householding had to be done. Nothing special so. Although I also made some more elements for the new kit. Yesterday was real busy. First of all we almost overslept in the morning! I woke up just in time to wake Jan too, and be up for the health care lady. she looked at Jan's leg and foot and decided it all looked very well, it was back to normal size, and practically had no more fluid in it, so Jan got no more bandage on it. Yippee! They agreed to give it a try, if any problems would occur he could call them and they would come in the weekend to give him another bandage. If not, she would come anyway on Monday morning to take a look, and decide if the doctor has to be called to ask if it still would be necessary. So Jan all happy that he could put on his shoe again without any problem, went out in the afternoon with the tram to town city and have a look for I don;t know what. Him being out of the way, I had all time to make some piroshki(meat pie in little bread shape) and made a soup too. That took some time, having to wait a bit for the dough to rise( I made it this time with some yeat in it), then had to clean up the kitchen( I always make a terrible mess when cooking and baking LOL), and it was already around 17.30 p.m. that all was done and still Jan not home. Hey, what was the matter? I called him on his mobile and asked where he was and what he was doing. Poor soul was on his way home, but all the trams ( at least the ones coming to our area) didn;t ride, because of a cable rupture! Oh my, he had to walk all the way home(after waiting for nothing some time at a the stop of the tram. At about 18.00 p.m. he was home, rather tired of all the walking and that for the first time without his bandage. So I hope it will not effect his leg too much, yesterday evening it was still okay as far as I know. Weather here is really a bit like Autumn weather, some rain, some sunrayes, lucky the wind is just a little breeze now, so all together we still cannot complain, the more as temperatures are still around 59 to 65 F.
Sp perhaps we can do some work in the garden this weekend, some spots have to be cleaned up, to prepare them already for next year's planting and sowing. I think I have a nice suprise for you, another kit. It is one I already made before the computer crash and before all things happened in our lives, I looked into my blog if I posted this one yet, but as far as i can tell I didn't. So here is 1st part of the kit named Love the Memories. Let me know when I somewhere already offered this one, okay? And if not, well, you're in luck LOL! I will be back with a post, may be even it will be tomorrow, but everything is okay. It's just that I am ;late today, so have to do some things first. I am in baking mood lately. We both love to watch a program "heel Holland bakt" on Sunday evening(it is like in Englad Great Britains bake-off) and it is getting exciting, because next Sunday there is the final. But it sure gives you some ideas to bake something yourself. I am not great in that, never did much with it, but okay, I gave it a try. Monday afternoon I made a "Messy apple crumble"and as was my first, i think it wasn;t bad at all. We had two portions out of it with our evening coffee. It was easy to make, but I liked it. Yesterday we stayed in whole day, because the weather was terrible. Lots and lots of rain, together with very hard wind, almost storm, in the evening there even was some thunder and lightning. so definately nno weather to be outside. I took advantage of it and prepared the veggies we bought at the market for the freezer(red cabbage and Brussel sprouts). Today the weather looks much better, although there still is too much wind to my liking, but okay, there is some blue sky to see. So today I will go out again, to do a some grocerie shopping. And may be this afternoon I will bake some more, I have some ready made puff pastry sheets in the freezer, and some pears, so I can make a few pear turn overs. Easy to make but yummie. With those plans in mind, I think I need to get moving now, and if some time is left, can perhaps add some more elements to a new kit I am making. Terrible, how quick the hours in a day are used up, and dinner has to be made. Sorry for skipping a day! I really watned to post on Wednesday, but for now every Monday, Wednesday and Friday we have the health care coming over in the morning. Not that it really prevents me from blogging, but before she comes we try to get the room a bit "organized"LOL, then I have email to check, and read some blogposts from others and sometimes morning is gone already. Rest of the day i try to be busy with things needed, like laundry, ironing, cleaning the house every time something, and then have to spend time on the computer with Official things, like form filling, writing letters, all that not nice stuff. Then the afternoon was gone before I knew. Last couple of days I did all I mentioned, well, more or less, but today I promised myself to do the posting first. We are up today awefully early, because the lady of the hea;th care asked if she could come much earlier for once. So I think later today Jan surely will take a napp to catch up some sleep. The weekend is sounding to be real nice, weatherwise, so tomorrow we want to go to the market. Municipality is busy rebuilding/reorganizing it already for months now, and first part is about ready now. Instead of usual stands, there are now little buildings more like shops. It looks rather nice, but I wonder if the rent prices for the market vendors will go up sneaky, and then the prices for the products too. We'll see in future. Oh, yesterday we received a letter from the health care disability payment department, that because of our appeal Jan will get a new interview on the 10th of December, where he will be able to explain to the full why he thinks he will not be able to work for 100%, it will be done ny another doctor and he may have an research by that doctor. I will go with him, perhaps i can be of any use. If Jan can reach disability of more than 35% he will get monthly payment from them, partly, and he will have to work for the other percentage. but it will be easier I think. Let's cross fingers by that time that the outcome will be favorable for him. Will make things a lot easier. 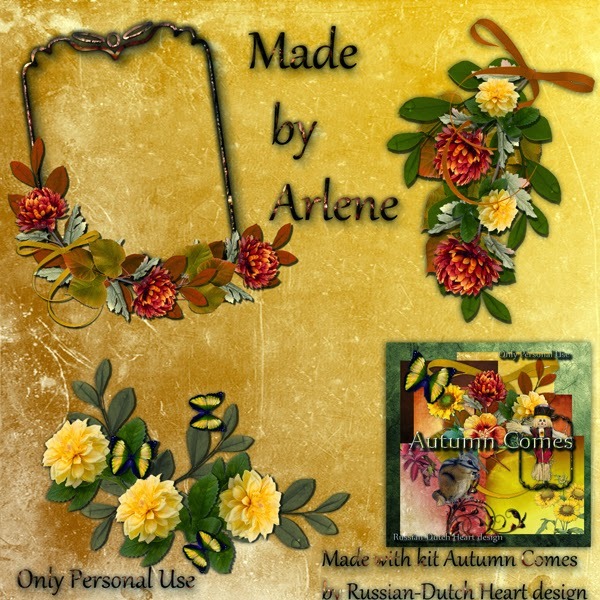 I have a nice surprise for you today, yes, I finished a kit, zipped it and uploaded it and already sent it to Arlene(my very patient creative team) and now I can offer at last a new little kit. I am not in full designing swing yet, because my mind is occupied with all stuff for health care, health security and such, but I am glad I made one. 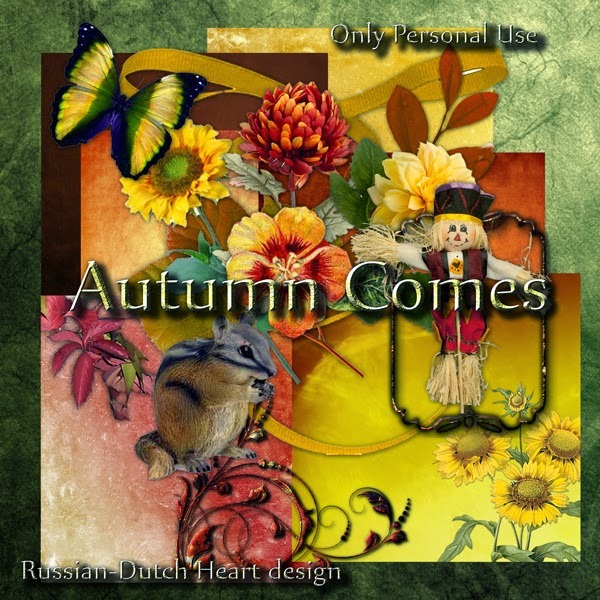 It is named "Autumn Comes"', all in those warm autumn colors, and I also have already the clusters made by Arlene. This weekend I will try to make the preview and upload them, to have them ready for you soon. Home after a necessary trip. Yeah, I am late in postingm but I just couldn;t find time for it this morning. First we had to wait for the health care lady, so before I wanted to be dressed properly, then made coffee for Jan and me, and had to check a few things on internet. Then a morning is done with in a second. just a whole trip for that. I took advantage of that and copied all kind of papers we have to send again for the appliance. Hmmm, all those things take a lot of time, and I really believe time spent on this could take only half of it. Okay, done with it for today. The weekend was quite nice, I did some laundry, vacuum cleaning, removed some dust bunnies and did start baking something. I have made a Russian pirog, you could say it is a kind of minced meat pie, but you can fill it also with e.g. cabbage, or salmon, or whatever is at hand. I made it with minced meat, miced with choppe onions and some crushed hard boiled eggs. Make a dough, put half of it rolled out in a tray, put in the quick fried minced meat, cover it with the other half of the dough and hopla, in the oven for about 25 minutes. That i made fridau, and Saturday I made a chicken soup and we had great dinner with the soup and pirog. The pirog turned out to be really good. We had so much left that also yesterday we had the same for dinner. It was Jan's suggestion and he said: "why not have soup and pirog again, it tastes good and it will be an easy day for you cooking wise". Nice of him, isn't it? Weather slowly is going down now, it isn;t cold but also not really nice. Sometimes some rain. some moments of sunshine, yeah, summer is at it's end I fear. Still we did some gardening when it was dry and a bit sunny, the garden is getting emptier now, now we will have to wait till first frost and then we can take out the dahlia bulbs. Jan will try to get the bird feeder ready as soon as possible, so we can place it in the garden for our little feathered friends. I still have some "free"time left this afternoon, before starting dinner, so I may play a little game on the computer, and then in the evening I can do some knitting, while watching another soccer game of our national team. Oh, Friday they played also and amazing, they did win the match, although I didn;t find it very convincing. Let's see what they can do tonight. and if the game is boring and / or bad, we have a serie/film on a dvd that I bought the other day for just a few bucks. It says it has playing time of 315 minutes! Must be some British serie, about espionnage and such, so we will certainly enjoy ourselves watching it. I wish you all a wonderful day and see you on Wednesday! Rather good visit to hospital. Yesterday in the afternoon we went to the appointment with the surgeon for Jan's legs. I must say that the last couple of days it looks better and so he tells me too. Okay, here and there suddenly the pain comes back again, but it is less and he can walk now for a longer time, though it is very slowly. After a quick view on his right leg the doctor said it looks good, the wound is healing nicely. Because of the smaller troubles Jan still has with the leg(the left is behaving very well, now it is the right one giving him still some trouble) he still has to continue 3 times a week with the bandage and then the doctor wants to see him back in 3 months, they will do a special scan, as I understood, to see if really all is well with the vains. So all together I can say it was good news. But of course there also was a less nice thing in the morning at the post. We got a big envelop of the municipality, about the appliance of a social assistance benefit, and remember we already filled in several large forms with all kind of information, mainly financial. well, I thought they already had all,if missing some municipality can have information of the government, like the tax office, and about all our data is already known. But no, we will have to send copies of all kind of things, again, and reading that i felt sooooo frustrated and even angry! Can you imagine? Okay, today I will assemble all needed(have almost all already in a fiile, hoorray), and will have to copy all. I think I better make for sure several copies of each paper, in case we will have to send more LOL. Then within 4 working days we will have to go to an office to show our identity card and to have it copied, and probably we will get an interview in another office after a while. So they send you all around town, so far for public and governmental services! No, I will not ramble more about it, and yes, I understand you will have to show proof of your some things, but it could be done, I think,much more efficient, all almost in one session. And without sending people to all kinds of offices all around town, and on the internet. And don;t you believe it is easy to get some proper information by phone! That's quite a different story, Yes, yes, yes, I will stop now. Weather is, speaking temperature wise, still rather good, we only have now here and there rainshowers and at times gloomy weather, although today the sun is shining(for now). I know, summer is over, but I can deal with nice autumn weather, that could last all the way to spring, hahaha. Probably that will not happen, but we can always hope, isn;t it? This evening we perhaps will watch a game of soccer of our national team. Not that I am very hopeful they will do good. It is for qualification for the European championships in 2016, but their first game they didn't perforn well at all. So may be we will zapp around a bit, because there also is The Voice of Holland this evening and I really like that program. I know, we could tape it, but there are still a lot of things to record, so Jan will be busy to figure out what to record on dvd and not. Yesterday evening we had a mish mash for dinner, grin. I didn't feel up to really properly make a meal, so I just looked into the fridge. I had some minced meat, some chinese cabbage(really like the taste of it), some paprika, tomatoes. So I cooked a bit of macaroni and in the mean time stirr fried all the veggies, so that they still would be a bit crispy. Chopped onion to it, some herbes salt and pepper at the last moment added the macaroni to it and tadaa, ready. and yes, it tasted real good too. all ready in about 20 minutes ( counting also the copping of the veggies) Now that was quick! Today is our "free"cooking day, so I have no idea yet what I will eat this evening, neither has Jan(he makes his own on Fridays, usually). I still have some minced meta left, perhaps I can use that in a soup, for little meat balls. Hmmm, could be a good idea. Oh, the doorbell is ringing, I think it is health care, to give Jan a new bandage. Time for me to finish this post and get dressed too. And I have some things to do today and I want to have them done so I bid you goodbye and till Monday! feeling a lot more "myself"and had a busy day. yes, I am very late posting, this morning I was a bit lazy, then we had to wait for the health care lady, and then I first had to do some things. First I had a nice long shower, last couple of days I think the cold came out at night, I was wet from the transperation. Oh well, water and showergel is good for that. Already yesterday \I felt much better, but I think today the bug I had disappeared completely. So time to do some things again. After my shower I had another cup of coffee and then went out. I was lucky not to have much rain anymore(all morning it rained), and first went to pick up my new identity card. Instead of 5 years this will be valid for 10 years, great. It is quite expensive, we have to pay € 52,00 for it. Then I went for some food shopping, needed bread and cat food etc. I was back home rather quickly, and I started preparing dinner for this evening. I still had fresh spinach, that needed to be used and I made an oven dish with it with chicken and potatoe. That ready I put on some stew pears for our desert, had finally a sandwich and then had time to post. I will give you the recipee for the dish.Amount of the ingredients is for 4 persons. Cook sliced potatoes with some salt for about 3-5 minutes. Put 1 tbl.spoon olive oil in a pan, stir-fry the fresh spinach, with the onion, pepper, salt, nutmeg and herbs. Let it cool off a bit. Stir the egg with the milk and mix it with the spinach. Fry the chicken, with some salt and pepper, (or you also can use some ready made chicken herbs)not completely done. Then put on layer of potatoes, then the spinach, then the chicken, another layer of potatoes and end with some greated cheese. Preheat oven at 150 degree C.
Put the dish in the oven for about 20-25 minutes till the cheese is coloured a bit. Yesterday I made some elements again to the kit I just started. It is progressing, although still slowly, but I will get there. Already feels good to have again energy and inspiration for it again. I hope someone will try out the dish, it's really yummie and not difficult to make. Okay, now it is time for some relaxing, so I will play a game at the computer. Well, I must say I was quite busy. Friday, after the really short post, I got quickly dressed and after a cup of coffee I went to the market. It was nice weather for it. It was a good visit, i came back with several veggies, some cheese, etc. but when i was back home I really was happy to be able to sit down for a while. Saturday was even better weather and it inspired us two to do things in the garden. No, not really true. Jan did a bit, I cleaned out partly the borders, where still is work to be done. But start was there. Jan felt rather good and attacked the windows to the garden and now they look oh so shining! we also washed the curtains, and oh boy, they have quite a different color now ! LOL. I urged him not to do too much, he has to build it up slowly, but at least he could use his leg again a bit. Strangest is still as I told Friday, that at night in bed his foot is "killing"him, and during daytime there is almost no trouble. A thing to talk about with the doctor, visit is on Thursday. Yesterday weather was already less good, so I spent a bit of time in the kitchen, making stew pears, and rest of the day I just sat on the couch watching tv, but....................................tadaaa.............I finally started with a new kit. Can you believe it? it will take some time before it will be ready, but it felt good designing again. It will surely not be a large kit, but the start is there. Today temperatures are a lot lower, I think we will not reach higher than around 61 F. Brrr, that is quite a change, and it is hard to get used to it. It may be for only a couple of days(rain is expected too), and by the end of the week it may creep up to perhaps 66 F again. Much better. I think I will do some cleaning in the house, and I hope to go on for a short while on the new kit. First i will grab me a sandwich, and another cup of coffee, after that I might be ready to attack the house LOL. Must enjoy the last Indian Summer days. At the moment homecare is here to get Jan a new bandage on his leg. It looks already a lot better, still a bit swollen by the fluid in his foot. Strange thing is, that during daytime his leg isn;t hurting, or almost not, but at night he has a lot of pain. So this night he removed the bandage(naughty boy)took a painkiller and had a real good night sleep. Very strange. Well, next week he has his appointment with the surgeaon, we can talk about it then and see if bandage is still needed. The last couploe of days I did all kind of little tasks in the house, some food shopping and today the weather looks to be so nice, that I might go to the market to get us some fresh veggies. Not much news to tell, so I will leave it here and hope to be more amusing and interesting on Monday LOL. I am a bit late already this morning took it easy and a bit lazy, so now I will have to get in some action! No fun, making phonecalls to municipality! Monday after posting here, I got brave and took the phone up, to try to find out if any help was possible with filling in long forms. I know that some years ago you still could make an appointment, you took all necessary papers with you, and somebody helped you with that, and it gave possibility to ask some questions etc. You ONLY can do it on internet. But there might be possibility to get some help, if you went to an internet corner on 3 locations ( of the municipakity), there you could use a computer and if you needed some explanation or had a question, there might be somebody that jumped over to you for a little help. So far for municipality and or/governmental services, that are supposed to SERVE the public( I always was so naieve to think so). To finally get this answer I spend about 3/4 of an hour on the phone, being directed to different phonenumbers and such.! I just gave up!. I finally found a site where they at least gave a summary of papers you needed to fill in the form. So I assembled them first and then called Jan to sit next to me at the laptop(wonderful that I have that second screen) and we started. I must admit that most of it was clear enough and not too difficult. But always there are two or three questions that are a bit confusing, so I hope we did it right. After about half an hour it was done and send away and we even got a return mail that they received out application. and I could print out our filled in form. Now we will have to wait for a letter in which they will ask certainly for some copies of payrolls, bankaccounts, and lots more. Then we certainly will have to go somewhere to show our identity card, so they can copy it, it all is taking such unnecessary loss of time. But I am glad we did it. Yesterday I thought it was a nice day to go for application for a new identity card. It will expire end of the month. For that I could go to a district office, and that isn;t far away. came there and went to information desk to ask for renewal. Now see the office in front of you! At the desk 2 people, and at all the other desks and bureau nobody(visitors) to see! But no, they couldn't help me right away, I had to make an appointment. Ghee, unbelievable. kay, I can go back today early afternoon. After that I was so fed up that I decided to take a little walk, just some window shopping, Weather was nice and I calmed down, LOL! We are expecting house care today again, it looks as if Jan's leg is getting thinner, not yet as it should, certainly not to foot, but there is hope. And he can walk a little bit easier it seems. Most painful it is now when he tries to sleep at night, very odd! Is this a very happy sounding post? Hmmmmm, I don;t think so, I am grumbling and such too much, but okay, I am still a bit happy with myself, as we did all necessary things for now, I even had courage to make a new binder, with all correspondence and papers we will need for the applicsations, so if we are summoned for an interview I think I have all together and just have to take with us that binder. Hoorray! Next project is to go through more paperwork, and put them orderly in some more binders. I have them already together in binders, but through time it gets a bit chaotic and there are things that i can throw away. So big plans, I wonder how long it will take????? grin grin! Must finish now, so i can get into some clothes before house care arrives. Weather today should still be real nice, perhaps a day, to do not so much and just enjoy it. Have all a wonderful day.